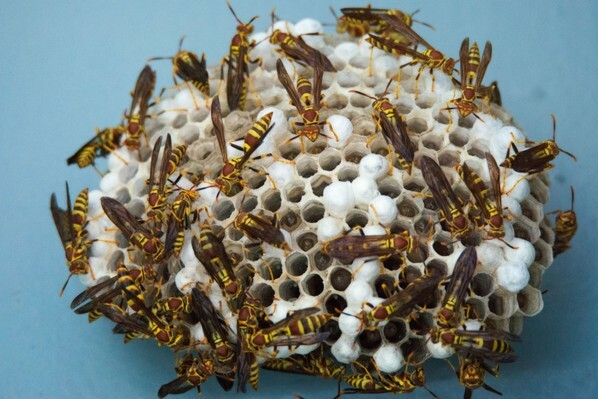 Paper Wasp Nest - the notWildlife Blog - A collection of high quality backyard wildlife photos. I noticed this paper wasp nest under the eve on the side of my house and my first instinct was to destroy it... But, I decided to go to google first. After identifying the type of wasp, Paper Wasps (I believe), I read the pros and cons of killing them. As for now, I am going to leave it alone as they are considered a beneficial insect and it is way high up out of the way. I took the photo above and watched it for several minutes and the wasps didn’t seem to be bothered or bother me so at least for now, they will live. I would love to hear your comments or wasp stories if you have one to share. Maybe you can change my mind.